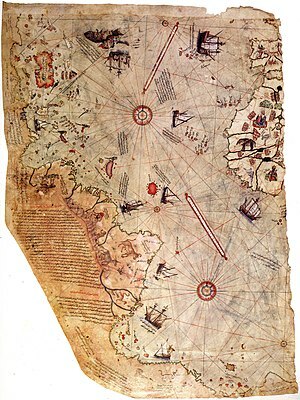 In 1513 Piri Reis, an Ottoman admiral, compiled a map. Today, about 1/3 of it remains. He admitted compiling it from other, older maps he had laying around. When he heard the news that Columbus had “found” the Indies, considering his source maps, I doubt he was very surprised. Clearly, he was already aware of something lying to the west. And to the south. This map is certainly anomalous, showing South America and Africa in proper longitude to within a few parts of a single degree. But there’s more! According to Charles Hapgood and his students, it also shows Antarctica, free of ice. While showing proper longitude 300 years before the invention of a reliable way to actually measure longitude, it is still explainable through the wise use of mathematics and a good knowledge of latitude, which has existed since the time of the Sumerians. An ice free Antarctica presents a different problem. The source for this map could be traced to a time when the region was free of ice, which we, with all our scientific expertise, have determined was about 34 Million years ago. So, either someone mapped Antarctica 34 Million years ago, or we are wrong about our estimates of exactly when the miles of ice currently covering it came to be. Either way, in 1513 no one had a clue Antarctica was there at all, ice covered or otherwise. The first modern sighting of Antarctica occurred on November 18, 1820. For me it comes down to this, at some point there was a being walking the earth, smart enough to engage in cartography, at a time when there was no ice on the coast of Antarctica. There is absolutely no record of when, how, or why this was done, in fact, there is no reason to assume that is was done in any historical time, since modern history begins in about 6,000 BC, and by that time the ice was very thick, and we have absolutely no record of any technology capable of penetrating the ice shelf until the 20th Century. This, to me, is clearly an artifact of what John Farrell calls the paleoancient civilization. I like that word, Mr. Farrell, and will happily steal it. It has a wonderful redundancy and wry sarcasm inherent in it that just suits me. By paleoancient I mean, before the most ancient civilizations we know of, before the Sumerians, before we have any real records, a time, which for us, is only a myth now.